Creatures you control gain indestructible until end of turn. 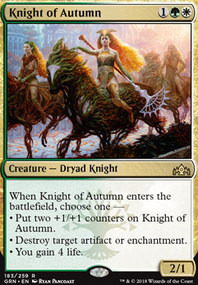 Addendum — If you cast this spell during your main phase, put a +1/+1 counter on each of those creatures and they gain vigilance until end of turn. Genesis26 Unbreakable Formation is in the deck specifically for the reason of the opponent casting a sweeper while we don't have a teysa or visitation out. Sheltering Light only protects one creature, so it's much worse than Unbreakable Formation since both our decks go quite wide (yours even more so). Once we do the opponent is actively helping us by sweeping the board since we get a bunch of afterlife triggers, creating massive angels or hordes of spirits. If I don't play my sac outlet early, then when do I play it? The earlier it's played, the earlier the engine starts operating. Playing something in the early game will not slow down the midgame; if anything does, it's randomly holding a card for no reason. I've played the deck at paper FNM's before. Didn't record the exact results; won around half my matches with it. It generally outpowers midrange decks once visitation is out, and the control matchup is medium/draw dependent (a lot of it hangs on how many counters they draw in the midgame). The deck is kinda soft to fast aggro though, as I often have to use our afterlife bodies to chump/trade with opposing creatures to avoid entering burn range, which leaves me with no fuel in the late game (if i survive) to abuse teysa and visitation. Midnight Reaper , while being one of the deck's best grind cards, can be an active liability vs aggro (especially mono-red). Overall, if there's anything the deck misses, it's consistency (if I can stick a teysa t4 or a visitation t5) we're easily winning, but often I just don't draw them early enough, and WB doesn't offer much velocity in card draw. Genesis26 This is not your average control deck. This is more of a hand-disruption deck that cores on mass discard. Also, give me any suggestion you can. The budget tag doesn't restrict the deck, it's just labeling the current form as budget-friendly since it's <$200. As for your deck, Awaken the Erstwhile is hilarious against my deck, but otherwise very poor. 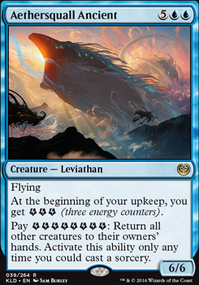 Captive Audience is very cute but not very practical, due to being 7-mana in a 22 land deck. It's also very easy to remove in the current environment due to the abundance of Mortify . Risk Factor and Sheltering Light are also a little weird in this deck. I'd just replace them with token makers, afterlife cards, and Unbreakable Formation to protect from sweepers. Another option would be Cruel Celebrant as a Blood Artist effect. 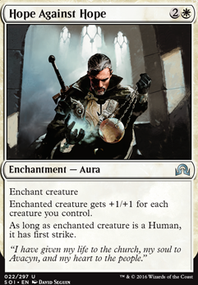 Against control, in your sideboard, Duress and Sorcerous Spyglass are king. If you're worried about the masses of planeswalkers that could support control come WAR, The Immortal Sun is also pretty good. Looks pretty good. Might need a stronger wincon since you don't have any evasion. Also might benefit from more options in the sideboard. Below is a mix of suggestions appropriate for main and sideboards in no particular order. mtwoods444 It's not a issue to go up to 4x History of Benalia it has tons of value, the only reasons I don't go up to 4 is because I find that I usually draw at least 1 per game already which is all I really need, and board wipes can make it into a dead card, which is why I have Unbreakable Formation in sideboard to help against it. 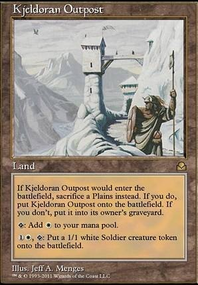 As for Mortify I typically only really need to use it when I need to remove a legendary creature or an enchantment, I keep seal away in for decks that don't mind their creatures dying, say like the Golgari deck for example. It also feels good when an opponent swings with something huge at you like a Ghalta, Primal Hunger and for 2 mana you can stop it in it's tracks. There's actually a cool finisher you can do (albeit for eight mana) with an enchantment deck. 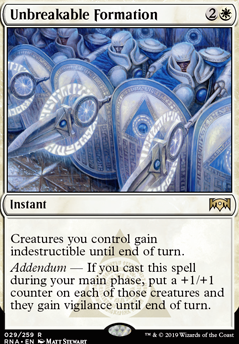 At the opponent's end step, cast Rampage of the Clans , then next turn cast Unbreakable Formation into Cleansing Nova for a big 4/4 vigilance and indestructible swing against your opponent's empty board.